Victims of the bombing atrocity in St Petersburg were identified today as the Russian authorities put the death toll at 14 with 51 wounded - four of them in a critical condition. Well-known doll-maker Irina Medyantseva, 50, was among those killed in the bloodbath after an explosion ripped apart a carriage on the underground railway. She threw herself over her daughter Yelena, 29, and in doing so saved her life, according to reports today. Yelena underwent surgery last night and is now in intensive care. It comes as Russian citizen Akbarzhon Jalilov, 22, who was born in ex-Soviet state Kyrgyzstan, has been named by security services as the suspected bomber who also planted a second device hidden in a fire extinguisher that failed to explode. Yelena's father Alexander Medyantsev said this morning: 'Yelena was accompanying her mother who was on the way to Veliky Novgorod town. 'I managed to talk to my daughter after her surgery when she recovered from the anaesthesia. She said that they jumped into the carriage at the last moment. Also killed in the lethal shrapnel bomb in the city's metro was Dilbara Alieva, 20, from Azerbaijan, who died from injuries at hospital after the terror attack. The head of one passenger, Maxim Aryshev, 22, from Kazakhstan, was torn off in the explosion. Initially there were claims he was a suicide bomber but this was later discounted. Aryshev was a regular visitor to St Petersburg, and last year had visited with his girlfriend. Others killed in the horror were identified as Yury Nalimov, 71 and Kseniya Milyukova, 18. Student nurse Ksenia Malyukova, 18, was killed in the St Petersburg metro blast, her tutors said today. A male friend Alexei friend said of her: 'She was a great person with soul of an angel. Svetlana Ilatovskaya, deputy director of St Petersburg Obstetrics College, where she studied, said: 'She was smart, goal-seeking, studying to become a nurse. Also wounded was 15-year-old Alexandra Zyablitskaya from Barnaul in Siberia. She had been to the city on a sightseeing tour with her grandmother. 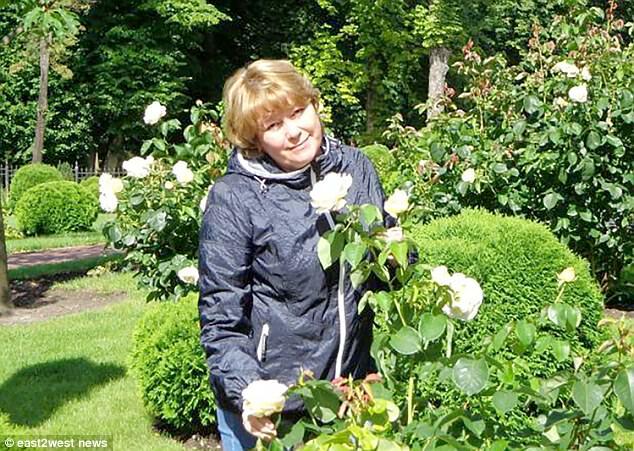 Psychologist Nadezhda Sosedova, 53, narrowly escaped death as she dozed in the bomb-hit metro carriage in St Petersburg. 'It happened so suddenly,' she said. 'I was sitting and snoozing. Suddenly something hit me on the head, there was a fire, my hair was burning, I managed to put it out. 'When we arrived at Technologichesky Institut station the doors were so crumpled that it was impossible to get out.